The Soulcalibur franchise needed either a hard reboot or an adrenaline shot, and Soulcalibur VI is both. The latest entry in the fighting game series, available 19 October, circles back for a do-over of the first few Soulcalibur games, retelling the major characters’ stories all over again and even putting everyone back in their original outfits. Soulcalibur V came out six years ago, and by now, it’s been all but forgotten. Between the controversial addition of a super meter and reduced movement speed, SCV matches tended to feel sluggish. The game’s tournament scene started winding down only a year or so after release, with longtime pros like Kayane stepping away due to disappointment in the design. Even for casual players, SCV had little to offer; its single-player campaign was only a few hours long and, bizarrely, it eschewed stories about the series’ popular well-known characters in favour of focusing on two unpopular nobodies. Soulcalibur VI reverses course on most of that. No one had populated the multiplayer servers in the advance copy that I got for review, so I can’t tell you about multiplayer yet, but I do have good news for those disappointed by SCV. There’s tons of single-player content, the game’s movement speed is faster, and there are some unusual new mechanics introduced in the game that make it easier to fight back when you’re getting battered. Ironically, these new elements revolve around slowing the game back down and emphasising its defensive options, but these elements serve to counteract the return to a slightly faster movement speed and will hopefully help newer players from getting flung out of the ring as often. There are two significant new move types in SCVI: the Reversal Edge and the Lethal Hit. When executed, both involve a big dramatic animation slowdown. Each character has different Lethal Hits they can perform, and the results look impressive and flashy, reminiscent of Tekken 7’s slow-motion moves. Clearly, Bandai Namco has decided that slo-mo fighting games look cool, and it’s not wrong. Learning which of a character’s moves can result in a successful Lethal Hit slowdown, as well as the best time to do it, will take some practice. The Reversal Edge, on the other hand, is easy for even a total Soulcalibur novice. It only requires a single button press, and it’s a good defensive move. If you’re taking a beating, you just tap that one button, and on the next hit, you and your opponent will enter the Reversal Edge sequence, a slow-motion rock-paper-scissors battle. The vertical attack button will beat your opponent if they hit the horizontal attack, the horizontal attack will beat their kick, and the kick will beat their vertical attack. But it’s more complicated than just rock-paper-scissors, because there are more options than just these three. Using the guard button or the directional stick will further alter your potential outcomes, so it’s more of a rock-paper-scissors-gun-dynamite situation. The Reversal Edge is a game of chance tossed into the middle of a game of skill, and since it’s built to work well as a defence, it puts a strong potential tool in the belt of the Soulcalibur newcomer. Here’s my Ivy with a Reversal Edge, then a Lethal Hit. Slo-mo on slo-mo. Another defence-friendly change in SCVI is that the Guard Impact move, which is basically a parry, does not cost any of your meter charge. You could always hit the block button for free, but now, there’s no reason not to do more Guard Impact blocks, which just require you to tap forward on the joystick and then block. Your timing has to be perfect, but since there’s no gauge cost and you should be blocking anyway, it behoves you to practice Guard Impacts. In its current form, Guard Impact can seem almost cheap. During the beta, I saw some players complaining that grabs felt less meaningful now that Guard Impacts cost nothing to do. This might get nerfed later, but for now, it’s worth practising it and maintaining a strong defence. Overall, executing moves in Soulcalibur VI is simple, which is another tick in the advantage column for newcomers. For example, Critical Edge, which is each character’s big splashy special move, can now be done with a single button press instead of a double quarter-circle. Some moves, like Ivy’s notorious Summon Suffering grab, still have the same kinds of onerous inputs that they always did, but overall, the game makes it easy to pull off impressive, damage-dealing moves. Combos feel easier, too, built from simple modular building blocks that require a simple press of one or two buttons, or double-taps in just one direction. The simple inputs encourage players to focus on reacting to their opponent’s movements and staying quick on their feet; dodging and defence is the name of the game. Soulcalibur VI introduces a couple of new characters, Grøh and Azwel. The former is an eyepatch-wearing swordsman who’s in denial about his evil side; the latter fights with a pair of enchanted gloves and rocks a dramatic villain voice that would put Skeletor’s to shame. There’s also guest character Geralt of The Witcher; his fighting style and lore seem like a decent fit for this magical medieval world. In other words, he makes a little more sense in a Soulcalibur game than Darth Vader did, but barely. Azwel’s the wackiest of the new additions, since fighting with enchanted gloves makes his entire weapon layout different from everyone else previously introduced in the game. He might be the F.A.N.G. of this series, but I love a low-tier weirdo, so I have a feeling he’ll be my new main. Lizardman isn’t on the character select screen. But don’t worry, you can make your own lizard. Soulcalibur VI also swings back hard at all the complaints about SCV’s lacklustre single-player content by including two story campaigns. The first, titled Libra of Soul, makes use of Soulcalibur VI’s character customisation options: You design your own fighter (human, lizardman, automaton, whatever) and select their weapons, fighting style, and aesthetic. Libra of Soul is a multi-hour RPG with a staggering amount of dialogue, most of which involves your artisanal protagonist exploring medieval towns and running into Soulcalibur mainstays like Kilik, Maxi, and the rest. You make “moral choices,” which are labelled blue or red depending on whether you want to do good or bad. So far, I’ve been making “good” choices, which means the Libra of Soul scales icon at the bottom right of my screen has begun to tip in the blue direction. In between dialogue and occasional run-ins with other famous Soulcalibur faces, the game takes me back to a map that will look familiar to anyone who played SCIII’s Chronicles of the Sword mode. The main difference is that Chronicles of the Sword took place in a different setting with different characters, whereas Libra of Soul takes place within Soulcalibur canon. Libra of Soul has plenty of RPG mechanics to break up the one-on-one fights. You collect food that can give you power-ups before battles, you can hire mercenaries to fight for you, and your character also increases their power level over time. I don’t yet know what the power level does, but I do know that playing Libra of Soul gave me a chance to level up my real-life brain by practising lots of different fighting styles. You can change your character’s weaponry, style, and even their body type any time you want. There isn’t much body diversity in this game beyond thin, thinner, and Lizardman, but I did like getting to switch between Cervantes’ dual blades and Tira’s wheel according to my whim. I’m several hours in to Libra of Soul, but somehow, I’m still only on chapter 2. So far, the story has a lot of unnecessary padding, with NPCs over-explaining their situations in every encounter, and tons of optional side quests. The sheer volume of dialogue feels like a reaction to the post-SCV clamouring for more single-player content. I clamoured about that myself when Soulcalibur V came out, so I’ll accept my overstuffed plate. Two familiar faces will shepherd you through both Libra of Soul and the other story mode: the aged Edge Master who teaches you (and almost everyone else in the game) how to fight, and the time-hopping, reincarnating Zasalamel, who got introduced late in Soulcalibur canon but has retroactively been put into the beginning of this game. (He was always there; you just didn’t notice. Or something.) Any time you’re confused, and even when you aren’t, one or the other of them will drop exposition on you about the two swords—there’s a good one, a bad one, and plenty of broken shards from each—the Evil Seed event, and the unfortunately named “astral fissures” opening up all over the world. Soul Chronicle, the game’s second story mode, lays out its chapter selection screen in the form of a timeline. Geralt shows up in 1586 A.D., or so say the history books. Although Libra of Soul is the first choice on the menu screen, the Soul Chronicle story mode would be a better starting place for a Soulcalibur newcomer. Soul Chronicle’s main quest line follows Kilik, retelling his story of how the enchanted mirror that he wears around his torso helps him from giving in to his evil side, and also, the childhood female friend that he still feels really bad about killing. She went evil, of course, so he had no choice—and same goes for all the other possessed unfortunates at the temple on that one fated night. Kilik meets the slick pirate Maxi and the lovely Xianghua, who just so happens to be the long-lost sister of that girl he had to kill. You’ve heard this one before, unless you haven’t, in which case, you’re in luck. 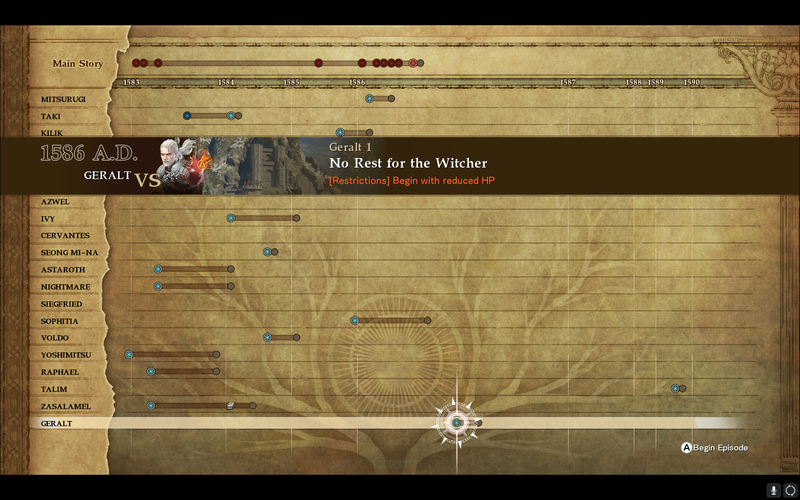 In addition to the main quest line, the game’s 20 characters (including Geralt, but not day-one DLC character Tira) each get their own multi-chapter individual storyline. Playing through all of Soul Chronicle will force you to play through several fights as each individual Soulcalibur character, which means you’ll learn how to play as everybody and against everybody. It’ll also deliver you all the exposition of the previous games in a streamlined, sensible format. There are too darn many proper nouns and duelling terms for the various swords in this franchise, but Soul Chronicle moved slowly enough that I think I finally nailed down which of the Ling Sheng-Su temple’s treasures do what where and with whom. There are almost no 3D animated cutscenes in this mode, only 2D paintings of characters’ expressions accompanied by text and voice acting. Having beaten every chapter of Soul Chronicle, I again think it feels overstuffed; a huge number of interchangeable possessed peasants get introduced in chapter after chapter, only to die by the player character’s hands. The peppered-in fights feel like scaffolding for the story that the voice actors are trying to relay, almost like I’m enjoying a Ken Burns documentary on Soulcalibur but I keep getting interrupted by having to pick up my controller to fight another skeleton pirate man. The Ken Burns Soulcalibur documentary is pretty fun, though, and informative. Many of the voice actors do a great job with delivering some very corny lines about enchanted swords and fighting a guy who goes by “Nightmare.” Soul Chronicle lampshades the over-the-top nature of that moniker several times: the Japanese samurai Mitsurugi never gets it right, referring to the enemy as “the Knight of Mare” the whole time. Overall, this feels like vanilla Soulcalibur: back to basics, and welcoming as heck. If you’ve never played any entry in this franchise before, this is a great place to start, since it’ll explain the entire story to you and teach you every character’s moveset along the way. If you haven’t played a Soulcalibur since the Dreamcast, you’ll find this to be a shinier and slightly slower newbie-friendly reboot of its core concept (you’ll also be amazed that Ivy is still technically wearing the same exact outfit as the Dreamcast version, except she’s, uh, more grown up). If you’ve played every previous Soulcalibur, this will feel like a nostalgic trip back in time, albeit a rose-coloured version, what with the easier button inputs and novice-friendly slowdown mechanics. But that’s okay. Soulcalibur needed some new blood.